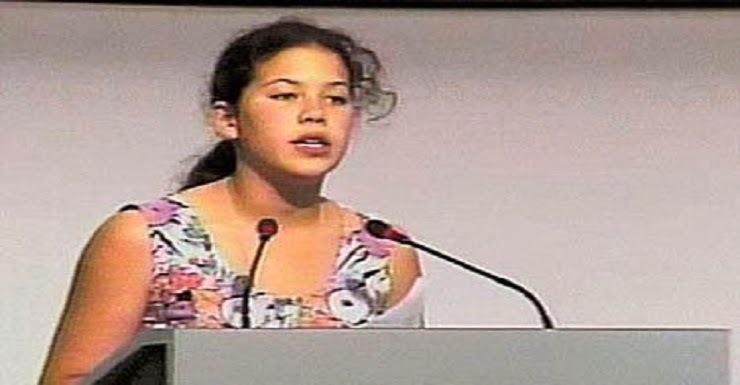 When Severn Cullis-Suzuki stepped on stage at the plenary session of the Rio Earth Summit in 1992, she knew this was her one opportunity to speak to the world’s most influential decision-makers. More than 21 million people have watched the speech on YouTube, where you can see that her address to silenced the entire plenary session. Severn’s young voice made it unmistakably clear why we all must take immediate action to save the environment. Twenty years have passed and Severn is now 32 years old, married, a mother of two young boys and an outspoken activist for environmental justice. She has received the United Nations Environment Programme’s Global 500 Roll of Honour, published a book, studied ecology and evolutionary biology at Yale University, co-hosted a children’s television series that aired on Discovery Kids, and launched an internet-based think tank called The Skyfish Project which was integral to the creation of the “Recognition of Responsibility” pledge at the World Summit on Sustainable Development in Johannesburg in August 2002. On June 17th 2012, she returned to Rio de Janeiro to attend the Rio+20 UN Conference on Sustainable Development. When I recorded Severn’s speech three days ago at an event hosted by WeCanada and later met her for a short interview (coming soon), I was deeply inspired to see that she had stayed true to the same values she expressed so powerfully in 1992. Though her scientific education has made her statements more refined and her age has added experience and wisdom, her belief in the power of intergenerational love is still at the heart of her message. “Twenty years on I come back to the same argument I made as a child with my presence at the summit. The strongest moral imperative that we have to act and change is our children. It is because of our children that we will bring back the connection between cause and effect, between choices, the global situation, between privilege and responsibility. In identifying our moral imperative lies hope and our hope is love – love for our children,” she said.